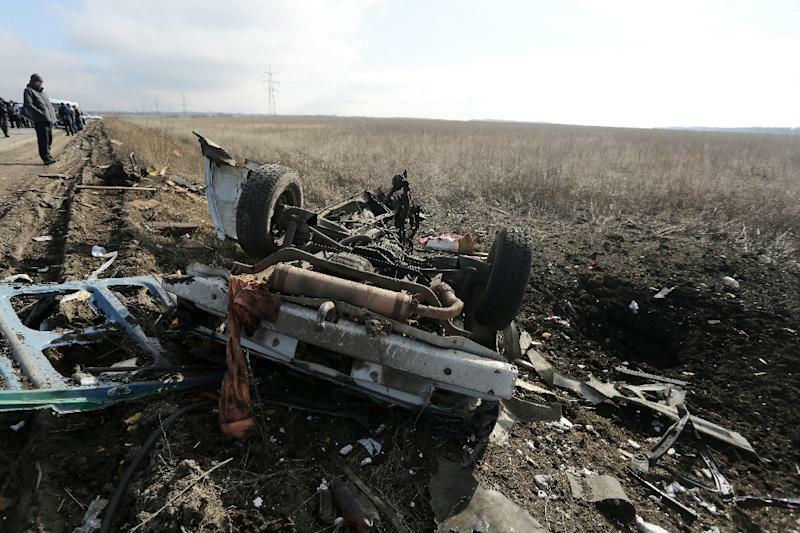 Marinka (Ukraine) (AFP) - Three people were killed on Wednesday when a passenger minibus hit a mine in separatist eastern Ukraine during a relative calm in fighting in the 21-month war. An AFP reporter at the scene saw pools of blood and personal belongings of the victims scattered near a checkpoint at Marinka -- a flashpoint village of about 10,000 people that witnessed heavy battles between pro-Russian rebels and government troops in June. "There are lots of anti-tank mines in this field and it seems that it hit one of them," a 55-year-old witness who identified himself only as Vladimir told AFP. "It was a huge blast." Ukrainian military spokesman Andriy Zadubinniy told AFP that two civilians died at the scene and a third in the ambulance on the way to the hospital. Local official had initially said that the body of a fourth victim was later found on the side of the road. But the pro-Kiev prosecutor's office in the region said in an email sent to AFP that "information about the fourth victim proved to be wrong." The incident occurred about 20 kilometres (12 miles) southwest of the de-facto rebel capital Donetsk as the bus and its five passengers were leaving a separatist-run part of the province towards a government-administered area. Officials said the driver had ignored mine warning signs posted along the road and drove onto a field a few hundred metres (yards) from the Ukrainian checkpoint. Ukraine's emergencies ministry said it had cleared the separatist Donetsk and Lugansk regions in the former Soviet republic's once-booming industrial heartland of more than 44,000 mines by the start of December. But the warring sides and foreign monitors are struggling to estimate how many unexploded devices remain. Continuing negotiations between the two foes on resuming the mine clearing work have failed to make progress in recent months. Rebel leaders quickly accused the Ukrainian forces of mining the field in violation of a largely-abandoned truce and political reconciliation agreement struck in February 2015. "We had insisted that Ukraine start de-mining roads and villages located along the front," the administration of the self-proclaimed Donetsk People's Republic said on its official news site. "But all of our demands are being ignored." Ukrainian officials refused to assign any immediate blame for the blast. More than 9,000 people have been killed and 20,000 injured since the conflict broke out in April following Ukraine's pro-Western revolution. Kiev and its Western allies accuse Russia of plotting and supporting the insurgency in a bid to unsettle the new Ukrainian leadership and keep it dependent on Moscow's good will. Russia denies the charges and in turn accuses Washington of orchestrating bloody Kiev uprising that toppled Ukraine's Kremlin-backed president in February 2014. A series of truce agreements have helped to ease the fighting but have not prevented periodic clashes from breaking out along the front.